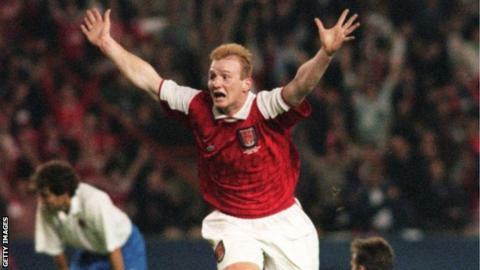 In his first season at Arsenal, John Hartson scored in the final of the 1995 European Cup Winners' Cup against Real Zaragoza. Twenty years ago John Hartson became the most expensive teenage footballer in Britain, when Arsenal paid £2.5m to prise the striker from Luton Town. The striker had begun his professional career as a 16-year-old, arriving as a trainee at Kenilworth Road in December 1992. It did not take long for the young Welshman to make his mark with his bustling, physical style and he made his senior debut at the start of the 1992-93 season. Hartson soon attracted the attention of then Arsenal boss George Graham, who was willing to spend big in January 1995 to revitalise the Gunners. The bid surprised many, not least the 19-year-old Swansea lad himself who thought he was being called into the Luton manager's office for a rollicking. "It came as a shock... David Pleat pulled me after training and he said, 'John can you come to my office this afternoon'," remembers Hartson, now 39. "I thought that if he's dropping me for Saturday I was ready to give as good as I got, because I'd scored the week before for Luton. "So I banged on his door, walked into his office all cocksure and he said, 'hi son', and I was, 'yeah, yeah, yeah gaffer, what is it?'. "He said, 'I'd like you to go home, have a shave, put a suit on, we've got to go and meet George Graham. Arsenal have bid £2.5m for you', which 20 years ago was probably the best part of £20m now. "It all happened very quickly and I went home, put the only tie on I had in my house, a shirt and a jacket and all of a sudden I was off up to Highbury, which is about 45 minutes from Luton. "It was a big moment for me in my life but I was very young and normally when you're young you take things pretty much in your stride. "I always got a bit more nervous as I got older, because you question yourself when you get older, can I still do it, can I still perform? "But at 19 I was like a raging bull: I had lots of energy, I had the legs for it, I had the desire. This was what I wanted to be, this was where I belonged." International honours soon followed the move to Highbury and Hartson won his first Wales cap in March 1995 in an away match against Bulgaria. The striker would go on to win 51 caps in all and score 14 goals in the process. Hartson would net 14 goals in 53 Premiership games for Arsenal before being sold to West Ham in February 1997. In his first season he had the distinction of scoring Arsenal's only goal in their 2-1 defeat to Spanish side Real Zaragoza in the final of the 1995 European Cup Winners' Cup. "So in I go at Arsenal, I go into that dressing-room with the likes of Tony Adams and Ian Wright, who was my strike partner," Hartson said. "It was a wonderful, wonderful occasion for me. From a council estate in Swansea to have gone on and played at such a young age for such a massive club was a great moment for me. "George Graham lost his job, we got to the Cup Winners' Cup Final and I scored in that game in Paris, so I'm in an elite band of Welsh players like Simon Davies, Mark Hughes, Gareth Bale that have scored in a European final. "I played with Dennis Bergkamp and these great, great players but I felt comfortable there. Arsene Wenger came [as manager] and he wanted me to sign a longer contract. "Harry Redknapp wanted to take me to West Ham, assured me I would play every week because I had Ian Wright and Dennis Berkamp at Arsenal - two of the finest strikers in the land at the time. "So I went and joined West Ham in 1997 and funnily enough Arsenal won the double in 1998, so it was one of those decisions I could have been a part of those [Thierry] Henry-[Nicolas] Anelka times at the club. "But I've always done things on the spur of the moment, maybe not give things too much thought. "But looking back - no regrets - I just wonder whether if I'd stayed a bit longer I could have added a few more trophies to the cabinet." Hartson played more than 500 games for eight different clubs during his 15-year career, including a £3.3m move to West Ham, a £7.5m transfer from there to Wimbledon and later in his career a £6m switch to Celtic. He retired from international football in February 2006 and hung up his boots for good in 2007 with more than 200 goals to his name. Hartson has admitted that throughout his life he struggled with a gambling addiction, while he attracted the wrong headlines for kicking West Ham team-mate Eyal Berkovic in the head in a 1998 training-ground incident. He was diagnosed with testicular cancer in 2009 and underwent emergency surgery after doctors discovered tumours in his brain and lungs. He is currently in remission and has carved out a second career as a respected football pundit. But two decades ago the young Hartson was just a fledgling footballer who became Britain's most expensive teenager, setting a trend that would see a string of managers break their club's transfer record to land the Welsh target man. "I probably don't appreciate it really as much as I should because at the time it just happened so quickly, and then obviously from Arsenal it was West Ham," Hartson added. "It was record money to Arsenal, it was record money to West Ham, it was record money to Wimbledon, it was record money to Celtic. "So I broke four clubs' transfer records during my career. That is a lot to take for a young man."